This is the fourth article in a series about the Todd Family, who were among the first European-American settlers in Atlanta. 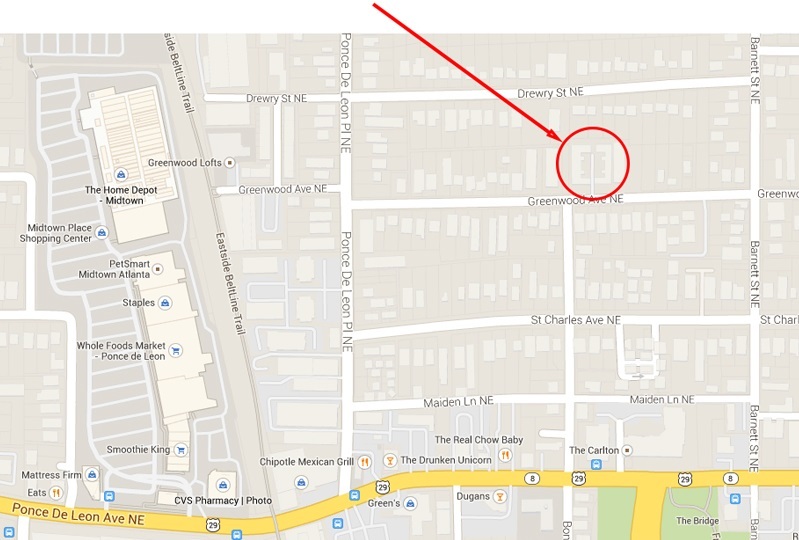 The other Todd articles are The Todd Family Homestead, The Todd Family Cemetery, and Todd Road. Richard Todd bought his land lot in 1822 which covered most of today’s Virginia-Highland neighborhood from Adair Avenue south to North Avenue, building a home in 1823 at 816 Greenwood Avenue. That’s a decade before Hardy Ivy settled in what is now downtown Atlanta. 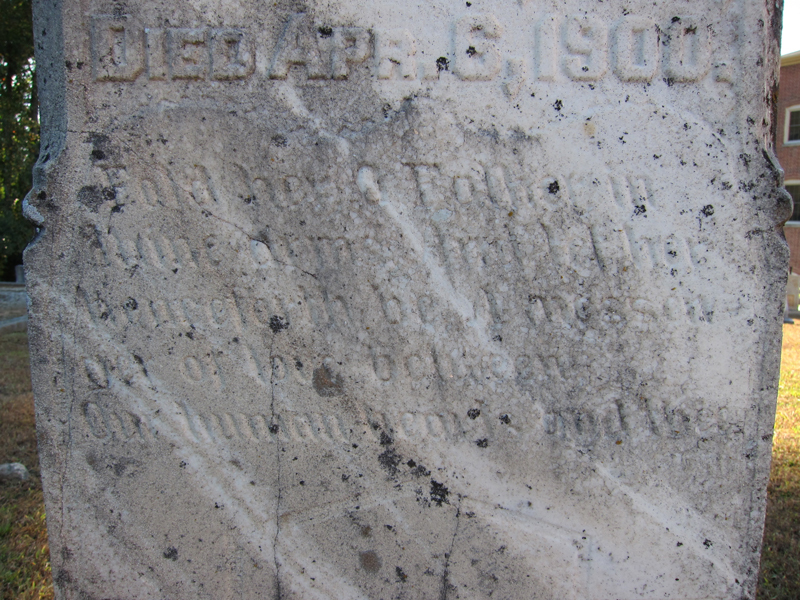 This fourth article focuses on the grave site of the Todd daughter, Patience Elizabeth (Todd) Armistead. Peachtree Baptist Church in Atlanta, Georgia is miles away from well-known Peachtree Street and gets its name from a market that once stood near the site of the present day church. Founded in 1847, it is the oldest Baptist congregation in Atlanta. It is located at 2108 Briarcliff Road NE, Atlanta, GA 30329 at the intersection of Briarcliff Road and LaVista Road. Its historic cemetery is adjacent to the church. In the mid-nineteenth century this intersection was known as the “Peachtree bartering station” where farm produce and goods were bartered on Saturdays. The name of the church was derived from this market site. In 2000 the Peachtree Baptist Church severed its ties with the Southern Baptist Convention and affiliated itself with the Baptist World Alliance. During this change, and in the intervening years, much knowledge of the history of the church and the church cemetery was lost and is only now being collected and reassembled. Because there are no Civil War era graves in the cemetery it almost certainly was established after 1865. The earliest death date observed on a headstone was 1890, but there were many headstones that were illegible and could be much older. 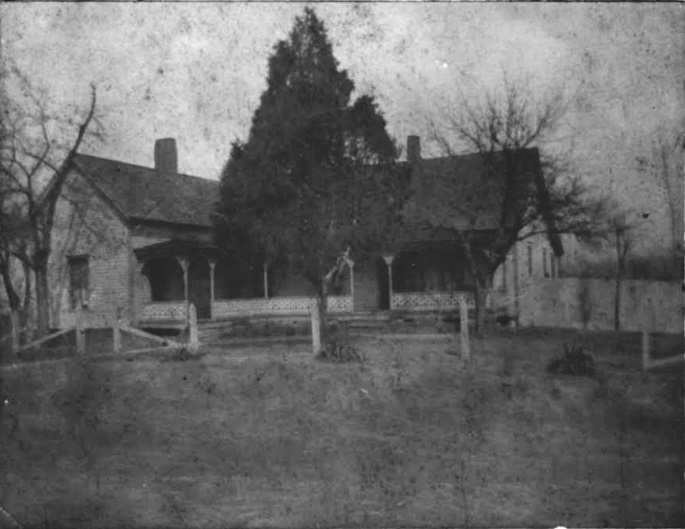 The Todds were early pioneers in the Atlanta area who settled in what is now the Virginia Highland neighborhood of Atlanta. As the previous article on The Todd Family Cemetery relates, the original pioneer family, Richard Copeland Todd and Martha Todd, have a memorial headstone that dates from the 1930’s, but nothing above ground exists of their original grave sites. The memorial is in the backyard of a Virginia-Highland residence. 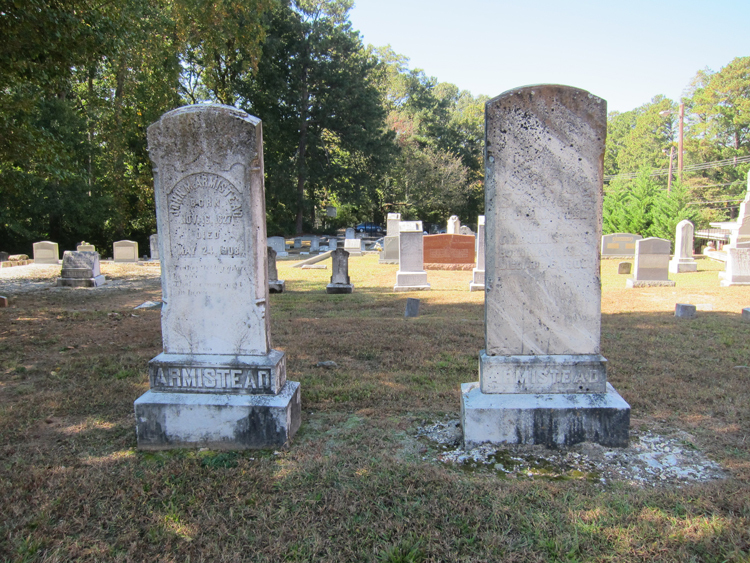 The only other grave site that exists from the first two generations of Todds in Atlanta is Patience Elizabeth (Todd) Armistead who is buried in the Peachtree Baptist Church Cemetery. The inscription specifically identifies her as the daughter of R. C. (Richard Copeland) and M. (Martha) Todd. 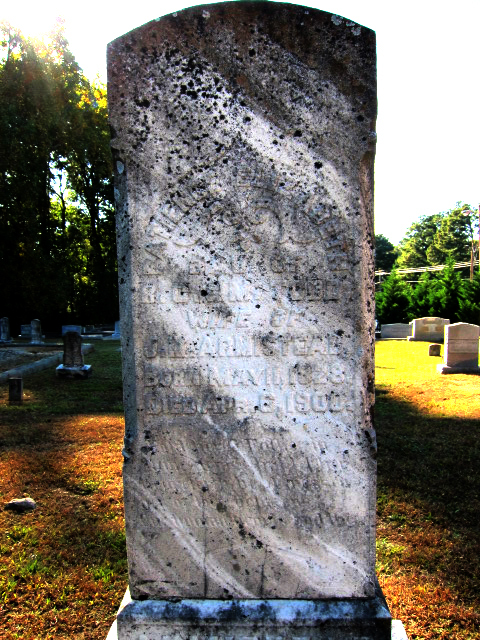 This is the oldest existing original reference to this very early Atlanta pioneer couple. It is a rare and important link to Atlanta’s earliest history. The inscription in stone also indicates deference and respect for Richard C. and Martha Todd, pioneer settlers, and their daughter. For Atlanta, a relatively young city, Patience’s birth date of 1823 is very old. Histories of the pioneer settlement of Atlanta usually start with Hardy Ivy and his wife Sarah Todd Ivy who settled in what is now downtown Atlanta in 1833. The Todds, however, moved to their Virginia-Highland homestead in 1823, ten years earlier, and Elizabeth Patience was born there in 1828, five years before the Ivy’s arrived. Although Virginia-Highland is considered a close-in neighborhood today, it was just outside the city limits when Atlanta was first incorporated in 1847, so the Ivy’s get the honor of being the first non-Indian settlers of Atlanta. The connection between these two settler families is strong. The wife of Hardy Ivy was Sarah Todd Ivy–the older sister of Richard C. Todd. 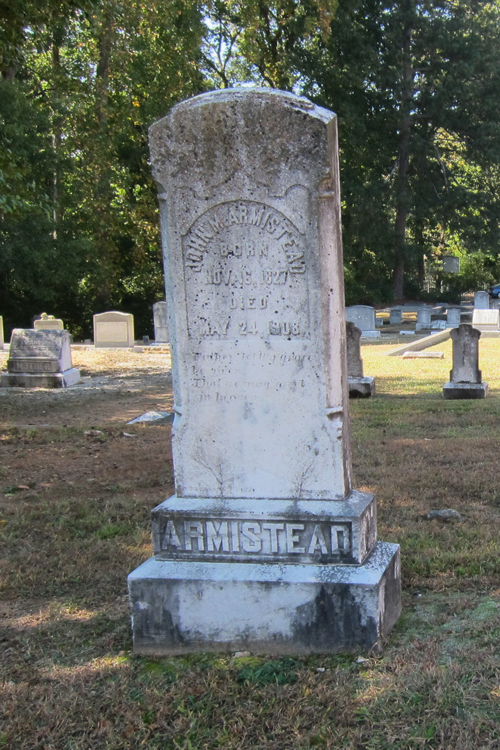 John Armistead was a year older than his wife, Patience, but he was born in Virginia and moved to the Atlanta area with his parents when he was a child. A newspaper clipping reporting on Mr. Armistead’s death states that at one point he owned practically all of Ponce de Leon park, a total of 200 acres. This was where he lived because the article goes on to say that he sold off all of it but his homestead after the Civil War, in which he fought for the Confederacy. The Todd Family homestead was less than 1/4 of mile from Ponce de Leon Springs, so the Todds and the Armisteads were neighbors. Patience Elizabeth did not have to move far when she went to live in the Armistead home after she married John M. Armistead. Old headstones deteriorate and wear away. Many old headstones are totally illegible. Patience Elizabeth’s headstone is still readable, but just barely. The references on it to her and her parents are unique, historical, and irreplaceable. An effort should be made to preserve this eroding link to the past before it fades away completely. This article is excerpted from a longer article on HistoryAtlanta.com titled “Atlanta Cemeteries Part 3” that was written by Conor Lee and Ray Keen. Ray Keen contributed part of the article about the cemetery at the Peachtree Baptist Church in Atlanta, choosing the cemetery because the sole daughter of Richard and Martha Todd was buried there. Happy Birthday to the memory of Patience Elizabeth (Todd) Armistead born on this day, May 11, 188 years ago in 1828. 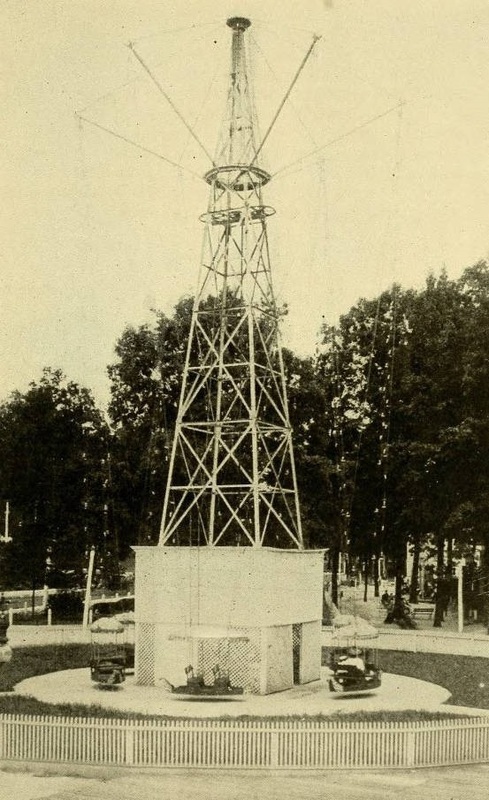 In 1924, a year before his death, her brother John C. Todd described the landscape the Todd children grew up in, “…deep forests of hickory, beech, and oak covered an undulating country, with an occasional softly defined hill or ridge adding to the beauty of a mighty expanse of trees.” That pioneer homestead was located in what is now the Virginia Highland neighborhood of Atlanta. Julia Carlisle Withers is credited as being the first baby born in Atlanta. Her headstone in Oakland Cemetery dates her birth August 17, 1842. It is even inscribed “ATLANTA’S FIRST BABY (“Atlanta and Its Environs” by Franklin Garrett, Vol. 1, page 196.) Patience Elizabeth (Todd) Armistead was born 14 years earlier in 1828. Born in what is now the Virginia Highland neighborhood, Patience Armistead may be the first (Euorpean-American) baby born in the Atlanta area. If not, she is certainly one of the first.